There are 100s of moments that shattered 90s kids hearts. When the Iron Giant sacrificed himself to save the town; when Chuckie Finster listens to his late mother’s poem, and when Jessie was left at the side of the road in Toy Story 2. But one event consistently comes to my mind when I look back on 90s television for its relatability and intense emotional content. I’m sure I’m not alone in thinking that–screenshots of this event have circulated around on social media countless times. These screenshots and the event that I am referring to are from “Helga on the Couch,” one of the most depressing and well-known episodes of the popular 90s-early 2000s TV show Hey Arnold. Hey Arnold was a show that centered around the everyday adventures of its titular character as he tries to solve problems for his friends and family members, helping them learn life lessons. One of the biggest antagonists in the series is Helga, a nine year old girl with pigtails who frequently bullies Arnold because she harbors an intense, secret crush for him. Helga’s behavior in the series is portrayed as disturbing and strange as she engages in practices that go beyond that of a simple schoolyard crush. Throughout the series, the viewer will see multiple versions of “Arnold shrines,” ones that have been composed from various objects, like used gum. Helga worships these Arnold shrines, at times drawing markings on herself and even going as far as to wearing his “head.” Helga also carries around a gold heart-shaped locket with a picture of Arnold’s face on it. She stuffs it down her shirt or in her dress pockets so no one knows she has it, and frequently takes it out when she’s alone to recite poetry and tender sweet-nothings to it. There’s no mistaking that Helga’s behavior is odd and out of place. Sometimes, it’s hard to feel any sympathy for her. Throughout the series, she mocks, belittles, and physically assaults Arnold. She does these things even though they cause her tremendous pain–often times after she’s hurt him, she escapes to a private place to lament over her actions and shame herself. But why does she hurt him in the first place, when she claims to love him so passionately? 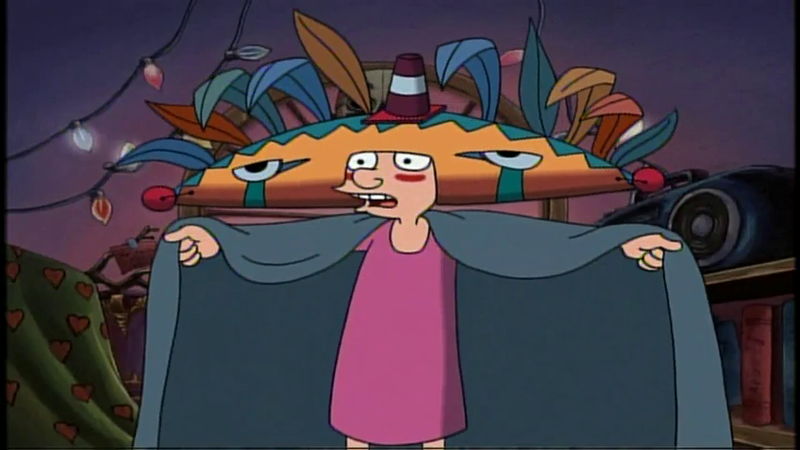 Why is Helga so twisted and painfully conflicted? As the viewer witnesses Helga’s violent interactions with Arnold in public and her adoration for him in private, we also get a glimpse of her homelife and her immediate family members. Helga has an older sister, Olga, a high-strung but sweet and talented daughter who their parents adore. In fact, their parents adore (and prefer) Olga so much, they consistently refer to Helga as “Olga.” As a result, Helga often feels like she’s in her sister’s shadow, and harbors a grudge towards her. But Olga isn’t so picture perfect. As seen in her first appearance, “Olga Comes Home,” when Helga changes one of Olga’s grades on her report card from an A to a B+, Olga spirals into a deep depression. When Olga cannot be perfect, she physically and emotionally suffers, and this weighs down on her parents tremendously as they struggle to cheer her up. It can be argued that Olga’s obsessive-compulsive desire to be “perfect” significantly impacts her self worth. While Olga may seem sweet, she can also be incredibly insensitive. In the episode, “Student Teacher,” when Olga spends a week helping out in Helga’s classroom, she carelessly tells highly personal stories about Helga and her struggle to stop bedwetting, which elicits malicious laughter from Helga’s classmates. Olga spends the majority of that episode whining about how she wants to be closer to her “baby sister,” but ends up destroying whatever chances she has for developing a relationship with her. Helga encourages her to go student-teach at an Inuit school in Alaska, demonstrating that while she respects that her sister wants to get to know her, she prefers to get to know her at a distance. A 3,000 mile away, let’s-only-write-letters kind of distance. Onto her father, Bob Pataki. Arguably, Bob is one of the most abusive father figures in children’s cartoons ever. He frequently insults Helga and forgets her name the most often. He’s also extremely insensitive and angry; spiralling off into screaming tangents. He struggles to get along with his daughter and beyond that, struggles to care for her. Frequently, Bob pressures Helga to be more like Olga, such as in the episode “Phoebe Takes the Fall.” In this one, Helga demands that Phoebe intentionally drop out of the quiz competition so that she can assuage her father’s anger by winning, and hopefully, make him less hard on her. In fact, Bob is the source of a lot of stress in Helga’s life. He creates strains in her friendships with her classmates, such as in the episode “Save The Tree,” when he threatens to cut down the neighborhood tree that the kids hang out at. He also insults her friends, such as in the Parent’s Day episode, screaming that he “will not lose to a little orphan boy” like Arnold in the midst of a competition. Helga quietly scolds her father, in shock, but is ultimately powerless to stop her father from being so cruel, even to the boy she loves. While Helga is only a nine year old girl, she feels like she constantly has to take care of her forgetful mother. In the episode “Road Trip,” when Helga and Miriam go on a cross-country drive to see Helga’s grandmother, Helga frequently has to remind her mother to “pay attention to the road” while she relies on Helga for directions. Twice, Helga actually has to reach over and grab the steering wheel from Miriam before they crash. Miriam doesn’t provide for Helga, either. She frequently forgets to make Helga’s lunches, at one point packing only crackers and a bottle of shaving cream. In the episode “The Beeper Queen,” Miriam takes over at the family’s beeper business while her husband recovers from a back injury. Suddenly, Helga sees a side of her mother that she’s never seen before: one that’s sober, smart, and competent. Miriam transforms into the mother that Helga has yearned for. She begins packing actual lunches for her daughter, even encouraging Helga to do her homework on the bed with her while she works. But this familial bliss is short lived, as she becomes more invested in managing the beeper shop and less in taking care of Helga. Helga returns to a life of opening empty lunch boxes and being neglected. Unable to take it, she goes to the lot where Miriam is filming a commercial. “‘I need you for a minute, Mom,’” Miriam mocks, shooing her away and insisting that she is too busy. It’s a moment that’s incredibly cruel. Here we see a nine year old girl, desperately wanting the affection and attention that has been withheld from her her entire life, and her mother casts her away. Eventually, Miriam realizes her cruelty and chases after her daughter, hugging her tightly. “The only thing that’s important to me is you,” Miriam says, in a moment that is supposed to be heartwarming, but really sets itself up to be heartbreaking, as we know she won’t shake her old habits. She asks her daughter for a second chance which, as the viewer already understands, Helga will give to her–and we know that inevitably, Miriam will forsake her. What’s even sadder about this whole situation is that Helga’s mother has developed alcoholism in order to cope with her crippling depression. The viewer learns that Miriam was once an extremely talented and active individual. In “Road Trip,” Miriam states that she was a bull-riding champion in her youth. She was also an Olympic swimmer, but gave up on those dreams once she got married. We learn this in “Olga Gets Married,” when she desperately begs her eldest daughter “not to make the same mistakes” she did, and marry a boy before finishing school. In “Beeper Queen,” she comments that she hasn’t “…been this happy in years,” while leaning back against her bed. Coincidentally, this is also the busiest that she’s been in years. Miriam seems to be more like Olga, happiest when she’s being a perfectionist. So, was there ever someone who stepped in at home to show Helga the love and support that she craved? Arguably, yes there was, albeit briefly–and this person was her nanny, Inga, who was hired by her father in the season three episode “Helga and the Nanny” to clean the house and take care of Helga while her mother is out doing community service (presumably, as apart of her sentence for drunk driving, but again, this is never explicitly stated.) Inga is strict, and tries to get Helga to act “properly.” She limits Helga’s outdoor playtime, teaches her cross-stitching, and enforces rules of etiquette. Of course, Helga resents this, so she frames Inga for stealing her dad’s belt buckle in order to get her fired. It’s only after Inga is gone that Helga realizes her mistake and worries that Inga will not be able to get another job because of her. Out of guilt and desperation, she goes to the park to visit her and admits what she has done wrong. Inga is cold towards her, and states that Helga “must face the consequences.” Helga is confused by this statement and protests, saying that she got away with it, so what does Inga mean by consequences? Inga simply replies, “You’re such an angry girl, Helga, and you won’t let anyone help you. So you must live with your unhappiness.” At the end of the episode, while avoiding one of her father’s tirades, Helga reads a postcard from Inga, who writes “I trust that your house is the same as always.” She sadly stares ahead, as if finally recognizing what her nanny meant by “consequences.” The consequences were that while Helga would get her freedom back, she would still be alone and unhappy in her household. Helga then returns to cross-stitching on her bed, something that she hated when Inga was around, but is apparently using as a coping mechanism now. So of course, with these unsupportive and often neglectful immediate family members, Helga has no one to turn to. As a result of her unhappy and unhealthy homelife, Helga has developed some negative, antisocial behaviors. This is what the famous “Helga On The Couch” episode addresses more explicitly than ever before in the series. 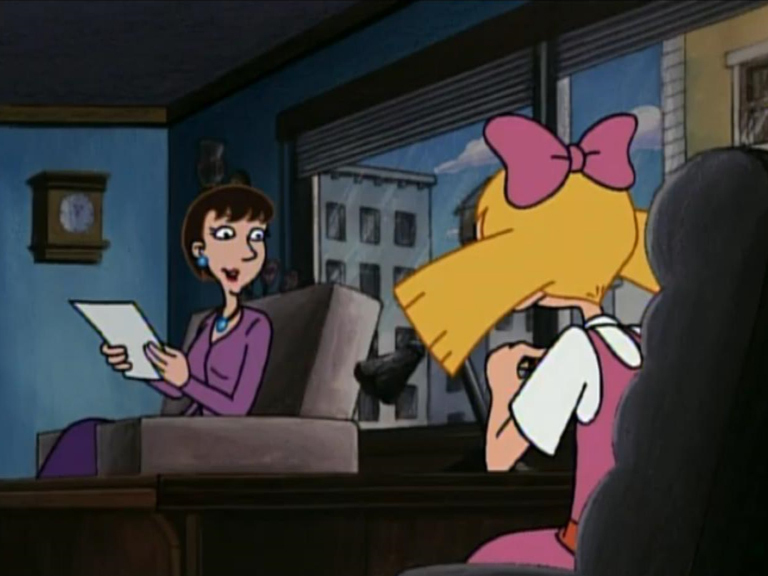 Dr. Bliss, a new school psychiatrist, begins shadowing Helga on her first day on the job. She witnesses Helga’s violent and antisocial behaviors, and after watching Helga punch Brainy in the face, schedules a session for Helga at her office. Helga is upset by this and defiant, reassuring Phoebe that she will only go there to waste the therapist’s time and will not tell her anything. But eventually, the all-too tough Helga becomes vulnerable after bonding with the psychiatrist by playing jump rope. She admits to Dr. Bliss that no one has ever noticed her. In a depressing flashback, Helga recounts her first day of preschool, which her parents failed to take her to as they were so infatuated with Olga’s concierto. In the pouring down rain, without a jacket, she walked to school alone, and has her lunchbox stolen by a stray dog. As we switch back to the flashback, we see a muddied Helga solemnly walking up the sidewalk and the familiar Packard of Arnold’s grandfather pull up alongside the curb. 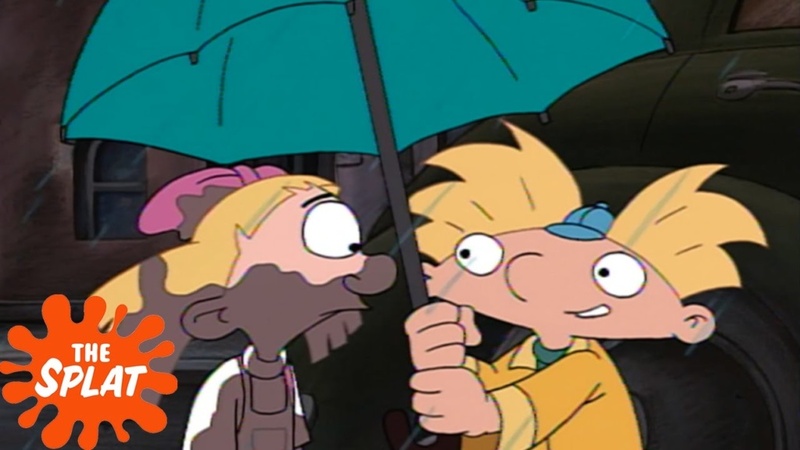 Suddenly, Arnold appears, and he holds the umbrella over her head, sheltering her from the rain. “I like your bow, because it’s pink like your pants,” he explains as he heads inside the building. Here, the show establishes the moment where Helga falls madly in love with Arnold, as well as the reason for why she does. Arnold was the first person who ever noticed her. Without thinking, he held out his umbrella for her. He even complimented her on her bow, and by the way that she responded, it was likely the first compliment she had ever received in her life. Helga moons over Arnold throughout the class day, staring at him and sighing happily. The other kids notice this behavior, and proceed to bully her for it. They laugh and point loudly at her, and she is overwhelmed. In an attempt to establish dominance, she beats one of the kids (Harold) up and bullies a few of the other kids. In turn, the kids correct their behavior and accept her as the “boss.” To further secure her place as the queen bee, Helga then engages in malicious bullying towards Arnold in an attempt to hide her feelings. Evidently, Helga only bullies because she sees it as a means of survival, and although she acts tough, she is deeply afraid of rejection. This is why it’s so critical to her to keep her love of Arnold secret. It’s not just that she fears his rejection–which she probably couldn’t handle–it’s that she doesn’t want to deal with the backlash from the other kids who will inevitably make fun of her. They didn’t witness the interaction that occurred between her and Arnold, and they have no understanding of her homelife–they can’t possibly know what he means to her. But Dr. Bliss provides Helga with the safe space that she’s always desired. Bliss doesn’t scold, shame, or freak out at Helga for her actions. She validates Helga’s feelings, and assures Helga she isn’t crazy and that she can love Arnold in whatever way that she wants. Dr. Bliss assures her that she can even keep her love a secret if she wants to, and that she will never tell anyone about Helga’s feelings for Arnold. The only condition that Dr. Bliss establishes is that Helga can’t be violent. Helga is extremely grateful for this, joyous even, and sad to leave the appointment when their time is up. She gives Dr. Bliss a huge hug before running out into the street. It’s a profoundly touching moment–finally, Helga has met someone who doesn’t shame her for her seemingly crazy actions, someone who won’t laugh at the ridiculousness of the situation, and someone who has tried to understand her. It’s a profound, life changing experience for Helga, and she goes home feeling happy. Admittedly, some of this is problematic. Dr. Bliss only encourages Helga to not be violent, but doesn’t strike down the idea of insulting others, as she doesn’t specifically call that behavior out. No matter Helga’s reasons, it is not okay to bully someone–even verbally and emotionally–just because you like them and you are trying to hide your feelings from them. Perhaps Dr. Bliss was just recognizing that baby steps were needed in this situation, and that there were a lot of things to unpack as time goes along? We will never know for sure, as this is the psychiatrist’s only appearance in the series, despite that Helga’s supposed to be going in for multiple sessions. A screenshot from a NickSplat video. But allow me to clarify something: Dr. Bliss actually isn’t the only character that has attempted to psychoanalyze Helga or seek to understand her. Although she bullies him and he strongly dislikes her, at times even fearing her, Arnold is the only one of the PS 118 kids who believes that Helga’s tough exterior is just a front. This is implied in the later seasons, when he knowingly smirks and says, “Whatever you say, Helga,” in response to one of her threatening statements or actions. In these small moments, it’s like he’s acknowledging that she’s putting on an act. Helga and Arnold even spend a few episodes bonding, such as in the Thanksgiving special, when they left their chaotic households and vented to each other about their peculiar families. When Arnold is rejected by his love interest, Lila, in the episode “Arnold & Lila,” Helga comforts him. One might argue from watching these episodes that they are becoming friends, but alas, there are still a few episodes where Helga is nasty towards him, and where he actually is egged on enough to play cruel pranks on her. Arnold doesn’t come close to understanding Helga’s complex behavior until “Married,” one of the last episodes of the series. When Rhonda uses a paper fortune teller to determine that Arnold will marry Helga, he is stunned and devastated. (Helga, who overhears their conversation, is thrilled.) That night, Arnold goes to sleep and awakens in a nightmare where he is actually married to Helga. He lives with her parents and does backbreaking labor at Bob’s Beepers while he envisions Helga sitting at home napping on the couch. Oh, and then the stork gives them three screaming, awful children on top of all of this. In the dream, Arnold becomes frustrated with Helga’s lazy, self serving attitude. He is so enraged that he grabs her by the shoulders and tells her that if they are going to be married, she has to start acting better. “Deep down, I know that you aren’t like this,” he says. Helga responds by saying that she knows that her behavior is undeniably cruel and admits that she doesn’t hate him. She says, “I actually really like you,” and almost gets to a point where she confesses her love for him. But Arnold wakes up before she has a chance to admit this. The next day when he heads to school, he talks to Gerald about his dream. He then says that he doesn’t think it would be that bad at all to be married to Helga. And Helga, overhearing this, is over the moon. This episode leads me to think that Helga is right: Arnold is really the only one in her everyday life who notices her. And by notice her, I mean that he seeks to understand her. On the surface level, he acknowledges her as being a bully, but recognizes that underneath that, there is something else. He doesn’t understand the reasons why she acts the way she does, but he acknowledges that he doesn’t have to. Whereas the other kids and adult figures would put down Helga for her neurotic behavior, Arnold does not. This again, reinforces why Arnold is so important to her, and why she feels so deeply for him. Sure, we as the viewers might think that worshipping someone in our bedroom closet is completely insane, but arguably, Arnold is the one who helps Helga to stay grounded. He does through his kindness and patient behavior, which in turn, influences her to want to be a better person. Hey Arnold is an impressive show on many fronts. It was one of the first shows that sought to address real-life issues in a way that communicates to its young audience without diminishing the strength of its message. Mental health is one of those issues that the show consistently tries to address. While the series certainly has its missteps, such as with the character of Curly, who is shown as crazy and naturally antagonistic, Helga’s mental health is handled more sensitively and delicately. Yes, she starts off as the enemy to the protagonist, Arnold–but Helga is not meant to be the villain of the story. She’s a product of the environment that she grew up in; she’s someone who has to unlearn the terrible behaviors she’s developed. After all, she doesn’t have a good example of empathy. She actively tries to make apologies to Arnold for her actions. Sometimes she succeeds, other times she is too prideful and takes it back. But regardless of how bad her attitude is and how strange her behaviors are, we grow to accept Helga. As the viewers, we recognize that her true character runs much deeper than the basic bully persona bestowed upon her. In actuality, Helga is just a young girl who is coping with some troubling stuff both on the homefront and within herself.